Recognizing and recording the identification of birds banded with unique combinations of colored, plastic leg bands. Conducting periodic censuses of banded and unbanded birds. Nest searching, visiting nests and recording nest contents with minimum disturbance, recording data about nest site. Trapping and handling wild birds using a variety of techniques. Taking a variety of morphological measurements of nestling and adult birds. Taking blood samples from nestling and adult birds. Behavioral observation and recording and quantifying avian behavior, development of time budgets. Quantifying ecological resources, including but not limited to habitat characteristics, food resources, predators and/or competitors, etc. and other ecological parameters. 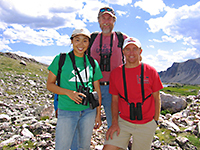 Sampling techniques for measuring avian community structure and composition, such as strip transects, point counts, and censuses. Entering biological data into a variety of database types, learning data quality assurance, including proofing and editing data. A variety of techniques for analysis and presentation of biological data, including but not limited to statistical analyses, spatial analyses, development of graphics, oral and written presentation of data. Critical review of all writing assignments. Literature search, critical analysis of published papers, bibliography preparation. 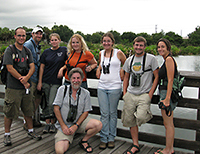 Our goal is to prepare potential graduate students in avian ecology for the rigors of independent research. We train them in the variety of techniques required to collect biological and ecological data, methods of data management and quality control, and methods for data analysis and presentation. However, we also introduce interns to the hypothetico deductive process as an integral part of the scientific method. To this end, each intern is expected to develop an independent project that utilizes the skills learned during training. The project should be of their own design, both intellectually and logistically, but should fit into the broader conceptual framework of our long-term research program. Our program enables prospective graduate students to refine their areas of intellectual interest, learn to articulate and then incorporate their original ideas into viable research plans, conduct that research, and then present the findings of that research. Interns are expected to develop oral and written presentations of their project and are encouraged to publish their findings. This foundation is designed to help these students succeed in their graduate careers and to provide a strong foundation for their professional development. Because our research is a blend of pure and applied, and observational and experimental approaches, students with broad interests in ecology and conservation may find our program rewarding. 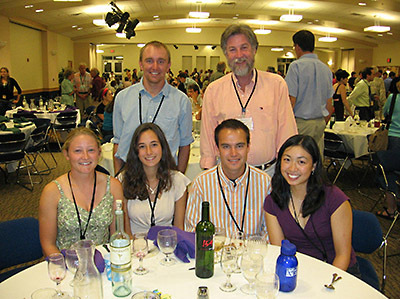 Interns are expected to devote their time to the lab’s long-term research projects and to their own independent project. We try to give students as much time as possible for their independent projects, but the needs of the long-term project often must come first. Interns work long hours and work closely with lab staff. Interns receive extensive training prior to the field season but training continues in the field. Typically interns work together with a more experienced staff member until they demonstrate sufficient proficiency to collect data independently. Because interns also are involved with data quality assurance, they further appreciate how training leads to better quality data. Interns work very closely with the lab staff to refine their ideas for an independent project and staff assist them with the logistics of data collection. Both in individual and group meetings we discuss the implications of student research to the broader field of ecology and conservation and our on-going research. Interns are often given specific reading assignments and regular lab meeting are held to discuss research problems, logistics, and general ecological questions. Students are expected to contribute ideas and topics for lab meetings. 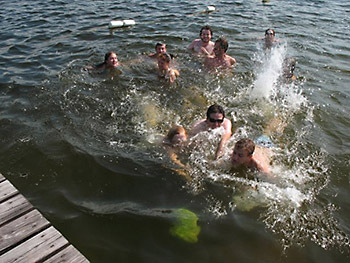 Upon arrival, interns are provided a broad orientation to Archbold Biological Station. This orientation, lasting several days, includes introduction to all the personnel and the various research projects on-going in the four research labs at Archbold. Interns are introduced to our librarian/information manager and the various information resources available and the variety of means to access that information. Our network administrator provides an introduction to the computer resources available and each intern is provided access to the network. Computer resources are available in the Avian Ecology Lab and in our central computer resources lab. Our Geographic Information Systems Lab Manager provides an introduction to the spatial and geographical resources available. In addition to the science resources, interns also are given orientations regarding research vehicle use, prescribed-fire management, office equipment, human resource policies, and the administration of an independent research facility. The intern’s immediate supervisor will discuss specific expectations for field work, work schedules and time off, and other lab protocols. During our field season, from mid-January through September, a variety of students, interns, and visiting researchers are resident at Archbold, providing a dynamic and intellectual atmosphere. Interns are provided opportunities to visit and assist with research in other labs to provide additional depth to their experience at Archbold. Additionally, seminars are held biweekly and interns are encouraged, even expected to attend and engage in discussions. The Avian Ecology Lab also conducts a monthly journal club where we read and critique scientific papers. Archbold provides a variety of facilities for recreation including a 90-acre lake with swimming facilities, boats, and a 5,000-acre natural reserve in which a variety of outdoor activities such as hiking, bird watching, nature photography, etc. can be conducted. Archbold Biological Station is in a rural part of the state of Florida. Without a personal vehicle, it can be difficult for interns to take advantage of regional resources, but many interns have cars and car-pooling is common. Archbold is within 2 hours of several large cities and their various cultural resources and within several hours of a wealth of wonderful natural resources, including the Florida Keys, both Atlantic and Gulf Coast beaches and coastal barrier islands, the Everglades, and a large number of diverse and interesting state parks. Interns are provided room and board. 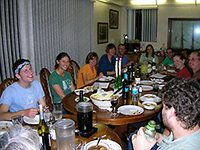 Meals are family-style and often provide a social nexus for interns. Where do our interns go next? We attempt to structure the intern experience in our lab like an introduction to graduate school, complete with lab meetings, journal clubs, proposals, and defenses. We provide a lot of advice about school and career choices and many of our interns have gone on to graduate school and some onto successful academic careers. Catherine Graham, Intern 1992. Associate Professor, Department of Ecology and Evolution, Stony Brook University. Focus on the effect of spatial and temporal arrangement of habitats on ecological and evolutionary patterns and processes. Matthew M. Shawkey. Intern 1998. Associate Professor, Biology, University of Akron. Research focus on the optics and evolution of animal colors from the Jurassic to the present. Brent Sewell. Intern 1999. Assistant Professor, Environmental Science, Temple University. Research focuses on how rapid human-caused environmental change affects mutualistic interactions and biodiversity. Daniel A. Levitis. Intern 2000. Assistant Professor, Max-Planck Odense Center, Department of Biology at University of Southern Denmark. Focus on Evolutionary Biodemography. Ondi Crino. Intern 2002. Postdoctoral Research Fellow, Centre for Integrative Ecology, Deakin University, Australia. Research focus on the immediate and sustained effects of the developmental environment on phenotype and fitness. Matthew Toomey. Intern 2004. Post-Doctoral Fellow at Washington University in St. Louis working on systems-level understanding of the development, diseases, function, and evolution of photoreceptors. Robert Aldredge. Intern 2005. MS student 2008. Ph.D. at University of North Carolina. Now returning to the Avian Ecology Program as a Post-doctoral Fellow. Joe Neiderhauser. Intern 2007. MS student 2011. Ph.D. student at Florida International University. Sinead Borchert. Intern 2009. MS degree at Louisiana State University. Just hired by USFWS. Carrie Robbins. Intern 2010. Just awarded her DVM degree from University of Minnesota College of Veterinary Medicine. Melanie Klein. Intern 2011. Awarded NSF Graduate Fellowship. Ph.D. student at University Massachusetts at Amherst. Caroline Amorosa. Intern. 2013. Ph.D. student at Duke University in Evolutionary Anthropology. John Cossette. 2013. Natal environment does not predict breeding environment, success, or adult behavioral phenotype in Florida Scrub-Jays (Aphelocoma coerulescens). Carleton College. Sonia Kumar. 2013. Does environmental matching result from passive signal degradation in adult behavior relative to habitat structure? New York University. Elise Nishikawa. 2013. The function of snake-directed mobbing in the Florida Scrub-Jay. University of Colorado Boulder. Caroline Rusk. 2013. Effect of satiation on future-oriented behavior in the Florida Scrub-Jay. Cornell University. Liz Schold. 2013. Relative abundances of the Great Crested Flycatcher across varied habitats. Harvard University. Bud Stracker. 2013. Adventures in parasitology: from vector ecology to sentinel chickens. Oberlin University. Lee Bryant. 2014. The effects of group size and oak scrub on juvenile provisioning in the Florida Scrub-Jay. Rhodes College. Kelly Commons. 2014. Does the response of Florida Scrub-Jays to predators vary with their perceived risk of predation? Milliken College. Mary M. Gray. 2014. Do nestlings cope with seasonal variation in predation risk by shifting resource allocation to growth within and between seasons? North Carolina State University. Stephen Mugel. 2014. Personality and allo-parental care in helper Florida Scrub Jays. Hobart College. Sheela Turbek. 2014. Perceived predation risk and parental investment in Florida scrub-jays (Aphelocoma coerulescens). Bowdoin College. Annalaura Averrill. 1993. Territory size, population density, and territorial behavior in suburban populations of the Florida scrub-jay. Bowdoin College. Chris Huh. 1993. Tree characteristics, resin flow, and heartwood rot in red-cockaded woodpecker trees in two hyrologically-distinct flatwoods communities. College of Wooster. Arthur L. Fleischer, Jr. 1994. Abundance of potential terrestrial nest predators in suburban scrub. College of the Atlantic. Lee M. Walton. 1995. Nest-site selection of Florida scrub-jays across a suburban gradient. Villanova University. Michelle M. Dent. 1997. Vegetation structure and post-fledging survival of Florida Scrub-Jays in suburban and natural habitats. Principia College. Matthew M. Shawkey. 1998. Contributions of insect abundance to brood reduction in Florida scrub-jays in suburban habitats. Wesleyn University. Barbara Beckworth Nemes. 1998. not completed. McGill University. Brent Sewall. 1999. Avian community structure and composition relative to fire suppression and suburban development in xeric oak scrub habitats. Penn State University. Arieh M. Levine. 1999. Caching behavior of Florida scrub-jays in suburban and natural habitats. Wake Forest University. Sonya C. LeClair. 2000. Effects of supplemental protein on nestling development and survival in a suburban population of Florida scrub-jays. University of Vermont. Craig Carter. 2001. Effects of supplemental protein on nestling development and survival in a suburban population of Florida scrub-jays, II. Anglia Polytechnic University, UK. Kathryn A. Smith. 2002. Consequences of double-brooding in a suburban population of Florida Scrub-Jays. University of Florida. Miles Becker. 2003. Variation in sentinel behavior of Florida Scrub-Jays with respect to food availability and predation risk. Cornell University. Kristin Bondo. 2004. How does Reproductive Effort in Breeding Season (n) Affect Survival of Breeding Male and Female Florida Scrub Jays to Breeding Season (n+1)? Purdue University. John Michalak. 2004. An Examination of Nest Defense Behavior Between Two Different Sites and Breeding Status of the Florida Scrub- Jay (Aphelocoma coerulescens).Ohio University. Kelvin Peh. 2004. Patch and landscape characteristics affecting nest success of a Florida scrub-jay population: an information-theoretic approach. National University of Singapore. Matthew Toomey. 2004. The effects of social context on the food handling behaviour of Florida Scrub-Jays (Aphelocoma coerulescens). University of Vermont. Sarah Wagner. 2004. Characteristics of abandoned nests and nests with eggs of the Florida Scrub-Jay (Aphelocoma coerulescens). Earlham College. Rob Aldredge. 2005. Factors influencing egg viability and hatching success in Florida Scrub-Jays (Aphelocoma coerulescens) across an urban gradient. Ohio State University. Ipek Kulahci. 2005. Influence of ecological and social factors on food handling decisions after cache recovery in Florida Scrub-Jays (Aphelocoma coerulescens). Stanford University. Jill Richardson. 2005. The tradeoff between sentinel duty and foraging for breeding male Florida Scrub-Jays (Aphelocoma coerulescens) during nesting in two fire regimes. University of Kansas. Tyler Beck. 2006. Tradeoffs between foraging and vigilance relative to habitat quality and residual reproductive value. Florida Atlantic University. Erin Hewett. 2006. Influence of recruitment age on the lifetime reproductive success of the cooperatively breeding Florida Scrub-Jay. Cornell University. Amy Shipley. 2006. Do neighboring Eastern Towhees (Pipilo erythrophthalmus) respond to Florida Scrub-Jay (Aphelocoma coerulescens) alarm calls? University of Toledo. Kathleen Black. 2007. Does dehydration explain high hematocrit in suburban nestling Florida Scrub-Jays? Stetson University. Irene Liu. 2007. Correlates of neophobia in Florida Scrub-Jays: the role of habitat specialization. University of Maryland. Joe Niederhauser. 2007. The effect of dominance on helping behavior and recruitment in the Florida Scrub-Jay (Aphelocoma coerulescens): A look at delayed dispersal. University of Michigan. Michelle Baird. 2008. Does helper presence affect breeder energy allocation behavior? Beloit College. Sarah Fansler. 2008. What mechanisms lead to the decline of Florida Scrub-Jays in overgrown habitats? Skidmore College. Kendra Kocab. 2008. Effects of rank in a dominance hierarchy on the behavior of non-breeding Florida Scrub-jays (Aphelocoma coerulescens). University of Texas. Jill Peiffer. 2008. Effects of relatedness and dominance on the behavior of non-breeding Florida scrub-jays. University of Minnesota. Sinead Borchert. 2009. Habitat selection by adult Florida Scrub-Jays during the nestling period University of California, Santa Barbara. Caitlyn Gillespie. 2009. Foraging distance of adult Florida Scrub-Jays (Aphelocoma coerulescens) during nestling provisioning. Knox College. Nicholas Sly. 2009. Variation in a female territorial call: The rattle call. Cornell University. Elizabeth Spinney. 2009. Nest size variation of the Florida Scrub Jay. Florida Institute of Technology. Dan Mallinger-Albrecht. 2010. Quit while you’re ahead: Reward and habitat-associated risk perception in the Florida scrub-jay (Aphelocoma coerulescens). Earlham College. Esther Cline. 2010. All Jays are not created equal: Helper provisioning in the Florida Scrub-Jay. Davidson College. Kimmy Kellett. 2010. Keep your enemies close: the importance of social familiarity on aggression between neighboring Florida Scrub-Jays (Aphelocoma coerulescens). Elmira College. Carrie Robbins. 2010. Livin’ la vida parasita: benign parasitism of Florida Scrub-Jays? University of Wisconsin, Madison. Melanie Klein. 2011. Nestling provisioning and territory quality in Florida Scrub-Jays (Aphelocoma coerulescens). Ramapo College of New Jersey. Sam Slowinski. 2011. Effect of habitat structure on the foraging behavior of the Florida Scrub-Jay (Aphelocoma coerulescens). Oberlin College. Alex White. 2011. Evaluating acoustic signatures in a cooperatively-breeding bird. University of Michigan. Jacy Bernath-Plaisted. 2012. Comparing predation rates of Florida Scrub-Jay nests (Aphelocoma coerulescens) in open and overgrown habitats. Beloit College. Heidi Heinrichs. 2012. The effects of relatedness and familiarity on reproductive output in the Florida Scrub-Jay. University of Vermont. David Moldoff. 2012. Is heterospecific eavesdropping by the Eastern Towhee (Pipilo erythrophthalmus) influenced by the presence of scrub-jays? University of California, Santa Cruz. Rebecca Windsor. 2012. What makes a territory? A socio-environmental view of Florida Scrub-Jay (Aphelocoma coerulescens) territory size. Franklin and Marshall College. Anna Scharnagl. 2012. Function of the contact call in the Florida Scrub-Jay (Aphelocoma coerulescens): can acoustic signatures aid in kin or group membership recognition? Florida International University. Julia Pilowsky. 2012. Spatial variation in kin structure in different landscapes: consequences for dispersal patterns and fitness benefits in Florida Scrub-Jays. Columbia University. Jon Skaggs. 2012. Volunteer pre-undergraduate intern. Overview of research in the Avian Ecology Lab. Now at University of Georgia.